Pop star Ed Sheeran has broken his right arm, putting his upcoming tour dates in jeopardy. "I've had a bit of a bicycle accident," wrote the star on his Instagram page, posting a picture of his arm in a cast. "I'm currently waiting on some medical advice, which may affect some of my upcoming shows. Please stay tuned for further news." The 26-year-old was on a break from his world tour, but was due to resume with a gig in Taipei next week. He has a further 14 dates scheduled this year, including concerts in Japan, South Korea and Thailand, before kicking off the Australian leg of his tour in March 2018. The tour is in support of his multi million-selling third album Divide, which was released earlier this year. Sheeran famously plays his concerts solo - using just a guitar and a loop pedal to layer up songs like Thinking Out Loud, Sing and Shape of You. 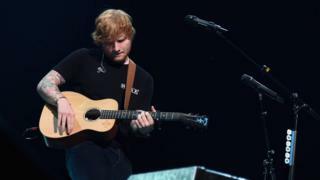 Losing the use of his right arm would make such a set-up impractical - but, speaking to BBC News earlier this year, Sheeran said he would never consider playing with a backing band. "I don't feel like there's anything interesting or new about seeing a singer-songwriter with a band behind them," he said. "I don't feel like if I suddenly got a band, everyone would go, 'Wow!'. I actually feel it'd take away from me."